Ahh…It is that special time of year again. Even talking about it makes me as gitty as a little kid in a candy store. The gloom that winter in New York brings becomes bearable, the start of white tents being erected makes you jump for joy, and news from Paris floods the media server. All of which indicate one very amazing thing. New York Fashion Week is just around the corner. A very eventful and monumental Paris Fashion Week comes to an end today, shifting the spotlight from the fashion capital of the world – Paris -to its suburb counterpart - New York. After reviewing the highlights from Paris, my brain began to scramble from overload. Trying to process all the amazing haute couture and ready-to-wear in one sitting is not recommended. Go slow. Pace yourself. So today, I will go over the things you will be hearing about from Paris. Then, later next week, I’ll check back in to prepare you for the marathon fashion party here in the big city. What will people be talking about tomorrow? After a 45 year career, legendary designer Valentino- known by many as the greatest creator of evening wear - walked the runway of his final show on Wednesday. Although the designer was able to hold back his tears, his a-list audience could not. 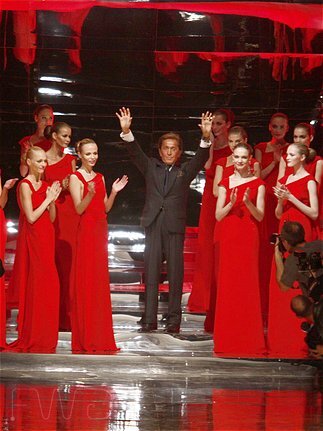 The rich and famous that made up his viewers gave Valentino a long and tearful standing ovation. Runway shows, especially in Paris, are expected to be theatrical and expensive. However Chanel brought new meaning to old rules. 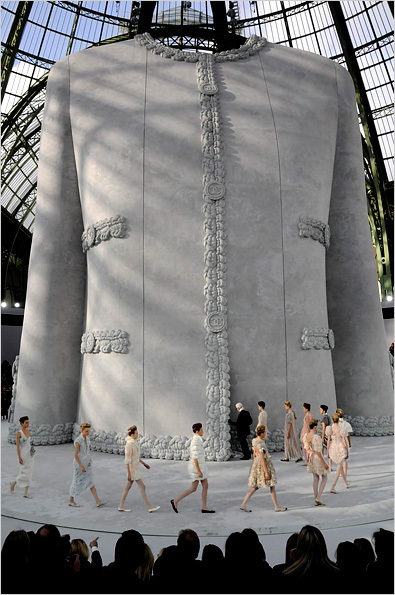 Head designer, Karl Lagerfeld erected a 75-foot concrete model of the iconic Chanel double CC jacket, from which the models emerged wearing the spring collection. The “symbolic hub,” as dubbed by New York Times reporter Cathy Horyn, set Lagerfeld back 1 million euro. The outrageousness that Chanel included in their show was balanced out by Armani’s lack of extravagance. The designer, who opened fashion week Monday, sent out a complete collection of very wearable designs. Too bad the prices aren’t as down to earth as the clothes themselves. The first to suffer are all of the night owls whose favorite shows like Connan and Colbert depend on daily scripts. 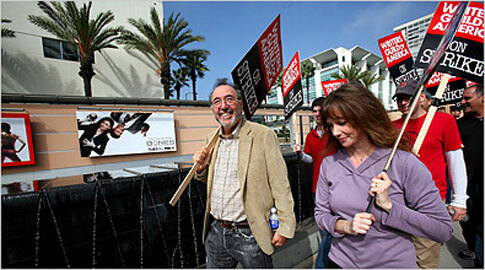 Although these funny-men were once the genius behind the jokes they told, legally hosts can only contribute to as much of the script as they did pre-strike. Get ready for re-runs and some stretched-out improvising like what was seen in the 1988 five month strike. Animated shows with productions a year in advance such as Family Guy and The Simpsons are in the clear for now. Soap operas generally have a month long episode back-up. And then there is prime time. Most long running shows have four to five episodes hidden up their sleeves, while some newer shows have had to put a halt on productions. So what will happen with Serena and Blair?!? What lies in the fate of Lost? Only time will tell. Until then – and it pains us to say – you may have to rely on reality TV, which remains completely unaffected.